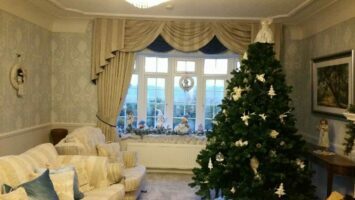 With over 40 years experience we offer hand sewn lined and interlined curtains, pelmets, Roman blinds, headboards, and cushions all made in our own workroom. Bay poles and rails are a specialty of ours. 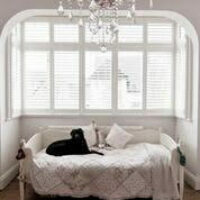 We have a wide range of blinds including wooden shutters and conservatory blinds. A complete measuring and fitting service is provided on all our work. Handmade in our own workroom, from the timeless look of swags and tails to ultra modern wave headings. Huge choices of blind styles available. Vertical roller and Venetian plus latest vision and plisse. MDF or solid wood supplied and fitted at surprisingly good prices. Free measuring and advice. Accessories to match your curtains including cushions, lampshades, tiebacks and much more. For the bedroom we upholster headboards and occasional furniture as well as making fitted bedspreads. Great service, competitive prices. Was happy to work round my shift work. Plus the blinds are blackout and let me sleep! Found Steve very easy to work with. Loved the large range of fabrics and the choice of poles. 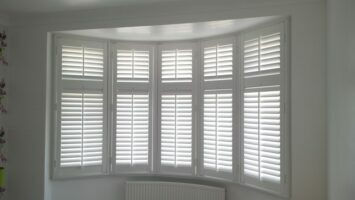 Thank you for designing all our shutters and explaining our options. You made a difficult job seem easy.